﻿ Download eduCBA Videos to MP4, MOV, AVI, MPG, VOB, etc. Download online learning videos from eduCBA, Lynda, Udemy, Treehouse, Coursera, Pluralsight, Digital Tutors, LearnSmart, etc. Want to download online courses from eduCBA for learning offline? Trying to download eduCBA classes to MP4, AVI for playing on iPad, iPhone or android phones or tablets? Below is a step by step guide on how to download videos from eduCBA with the powerful Bigasoft eduCBA Downloader - Bigasoft Video Downloader Pro so you can playback eduCBA classes anywhere especially at the place without internet connection. Acting as an ideal eduCBA Downloader, Bigasoft is highly recommended for its fast speed and powerful function. Besides, more than 100 video sites are supported including YouTube, Dailymotion, Livestream, CBS, Facebook, VEVO, MTV, etc. Download videos from eduCBA, Lynda, Coursera, Pluralsight, Digital Tutors, Udemy, LearnSmart etc with the excellent downloading video quality. Download and convert online classes from eduCBA to MP4, AVI, WMV, MOV, VOB, MPG, MKV, etc for playback on iPhone, iPad, Android smart phones and tablets or other portable media devices. Exact audio from eduCBA or other video sites to MP3. M4A, WMA, OGG, etc. Download and convert online courses in batch. How to download videos from eduCBA? Firstly, download and install the powerful eduCBA Downloader - Bigasoft Video Downloader Pro. Once done, you can follow the eduCBA Downloader step by step guide to download courses from eduCBA to MP4, AVI, WMV, VOB, MPG, etc. Go to the educba.com and copy the URL of the video you wish to download. Then turn to the Download panel of Bigasoft Video downloader, and it will paste the copied URL of eduCBA video to the URL box. Note: Multiple URLs can be pasted at the same time by clicking "for Multiple URLs" under URL box, so you can batch download more than one videos from eduCBA.com. Click "Save Folder" button to choose the destination folder for the downloaded eduCBA video. Usually, Bigasoft Video Downloader Pro downloads videos in its original format. If you prefer to download and convert eduCBA videos to your desired format, click the small triangle to the right of the "Automatically Convert to", a drop down menu will pop up to let you choose your desired output video or audio format. After all settings are done, click "Download" button to start the eduCBA downloading. Right-click the item in Activity panel and choose "Locate Downloaded File" to get the downloaded eduCBA video. 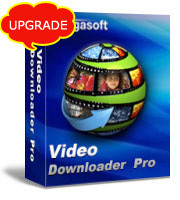 With Bigasoft Video Downloader Pro, you can enjoy eduCBA videos anytime and anywhere you like. Just download and install this powerful eduCBA Downloader now!